Asparagus Pea Lotus Tetragonolobus is an annual herb native to the Mediterranean region. Also commonly called Winged Pea, Square Podded Pea, Winged Lotus, this annual plant is easy to grow from Asparagus seeds. 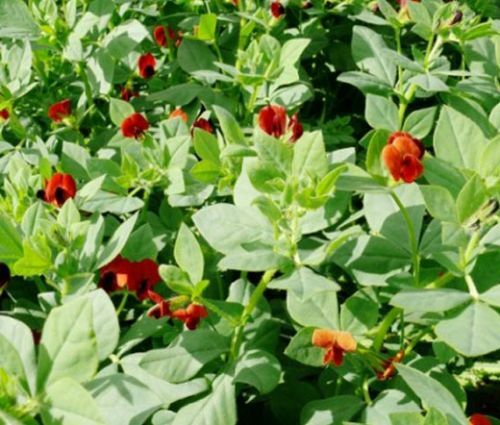 Winged Pea blooms with sweet, pea-like, deep-red to crimson flowers that grow in pairs above small trifoliate leaves. Following the flower pollination, the Asparagus Pea develops four-winged seedpods that can grow up to 3 1/2 inches by late summer. This plant is called Winged Pea, because the seedpods look like they have four wings. Asparagus is an attractive ornamental plant and can be grown as a ground cover in flower borders. As a vegetable, Asparagus Pea can be used with virtually any dish - the pods may be prepared the same way as asparagus and the flowers may be applied as edible garnishes to salads, cheeses, and other dishes. Asparagus Pods have to be harvested when they are one to two inches long to ensure edibility. Lotus Tetragonolobus grows best in full sun and prefers a light, well-drained soil with regular watering provided.